United Artists Lobby Card For The Bridge of San Luis Rey (1944). Last edited by johnbear; 02-20-2018 at 02:22 AM.. Reason: Replaced Link. Bathing Suit Cheesecake Circa (1942). Glamour Fashion Publicity Photo Circa (1940s). 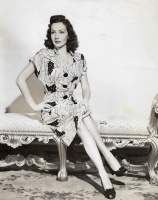 20th Century Fox Publicity Photo For Tampico (1944). Another 20th Century Fox Publicity Photo For Tampico (1944).